Learning from Life: What a wonderful day! I am completely worn out but very happy. Tonight was our Annual Neighborhood Open House and we had a ton of people come and stay, to enjoy the food and atmosphere of the Season! We started having our Open Houses over 16 years ago, only missing one when I was diagnosed with cancer. How blessed we feel to have soooooooooooooo many dear friends that are like family to us. There were many that couldn't come or who have moved away, but some how I felt they were still here in spirit with us ( maybe because I was missing them so much). But I am beyond spent so I will leave you with this sweet Christmas story. December is the busiest time of the year. Everyone's busy preparing for the holidays and continuing family traditions. Has it ever crossed your mind, as to how many really stop and think what Christmas is all about? Are we teaching our children the true meaning of Christmas or how many gifts need to be bought? If we have taught our children the true meaning of Christmas, what we've instilled in them will be carried into generations to come. I like to see families create traditions all year long. After all, the original gift to all of us here on earth, was given from His heart. For through our hearts, one single gift of kindness, can touch an endless amount of hearts forever. This is a story about a child that saw the importance of giving and never thought about giving up. Some may think a child isn't old enough to carry enough wisdom to teach us all a lesson in living. But I've learned a heart grows from life's many challenges and sometimes a child's challenges can be far greater than some adults. We met a little girl seven years ago, during one of my daughter's occasional hospital stays. Her name was Beth and she was my daughter's room mate for a week. Beth was a very happy girl despite her medical problems she was facing. Her long blonde curls always seemed to bounce with her smile. The girls got to know each other well and had become good friends. On the pediatric floor of the hospital, we saw many seriously ill children. It was so sad, even though my daughter had an incurable kidney disease and not a very good chance of living to see old age herself. We always saw many children with all kinds of cancer, and sadly enough Beth was one of those children. She was doing two weeks of chemo and radiation. I was amazed at her will and determination to never give up despite how very sick her treatments made her. She was always concerned about my daughter and the other children with cancer she grew to know over her many hospital stays. My daughter's IV treatments were done after a week and I was happy to finally bring her home. We were awaiting the final discharge orders when Beth appeared from the other side of the curtain that separated their beds. She said, "I want you to have this. I know you need a new kidney, so keep this angel pin with you till you get better. She will watch over you so you smile all over. My friend, John gave this to me to watch over me, but it's time for this angel to watch over you. When you get your new kidney and smile, you can give this angel to someone that needs her too. I'm done reading my book so here's my bookmark that has a poem on it called, Don't Quit!, I know it by heart anyhow." My daughter thanked her and the girls exchanged hugs and big smiles. I knew, we may never see Beth again, but we never forgot the gift she gave from her heart that day. During that year, we found out Beth has passed away. It was so sad to know such a beautiful little girl was no longer bouncing smiles to everyone she would meet. Her sincere kindness will stay with us forever. We kept that angel for six more years. My daughter had gone beyond what medical journals had studied and expected from her disease. Was it the angel watching over her or pure luck? My daughter ended up on kidney dialysis for over a year, and one month after almost loosing her, a kidney became available and she received a transplant. 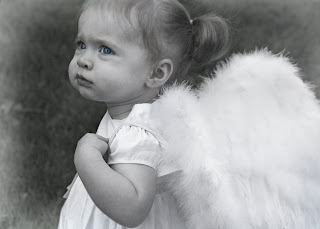 My heart tells me, an angel upstairs was watching with a loving smile. My daughter had kept that angel pin and now she felt it was time to give it to someone who needed watched over till they could smile again. She gave it to an elderly man trying to overcome the damage from heart problems and undergoing extensive therapy. His family has informed us, that when he returns home he wants to give the angel to someone he knows suffering from a brain tumor. How many families and hearts this angel has touched no one knows for sure. But all it took was one single gift of kindness, that has and will touch an endless amount of hearts forever. So this Christmas season, look around and see that gift that can't be bought. Create a tradition with your children or maybe someone you love. Make someone's day and do the unexpected, let a friend know you care, or greet a stranger with a warm smile. Give the gift that keeps on giving. It's open twenty-four hours a day, three hundred and sixty-five days a year, it's a gift from your heart. After all, isn't that what Christmas is all about?